Rachel and Kimber in Potter County circa 2000. I've been to the Bahamas, Los Angeles, and Oahu, but to me the single greatest family vacation destination will always be Potter County Pennsylvania. A weekend at the Belltown Hunting Club was the absolute highlight of the year as a child, and I still enjoyed it well into adulthood. 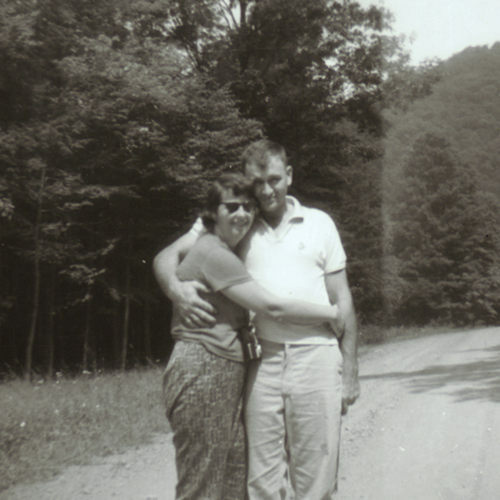 My mother's first visit to Potter County was on her honeymoon. She was expecting a luxurious, or at least comfortable, mountain lodge, but instead found a crude, musty-smelling building with no running water, inhabited by rodents. The camp was heated by a cook stove, and up a steep, narrow staircase the "bedroom" consisted of rows of military bunks. The toilet was a 2-hole outhouse just to the right of the cabin, and if you were not overly modest, you left the door open for fresh air and to scan for any wildlife creeping up on you. Washing dishes and personal hygiene were drudgery. Water had to be carried in a bucket, uphill from the spring, and heated on the cook stove. My mother endured many annual trips to Potter County, and on a good year we went twice. As we grew older, the number of snorers increased leading to sleep deprivation and morning recriminations. It was not a fun time for Mom. Mom and Dad were toting 3 kids along to Potter County by 1964. 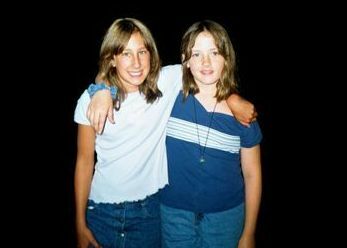 It was the summer of 2000 when I set off for the mountains of north central PA with two 12-year-old girls - my daughter Kimber and her friend Rachel. 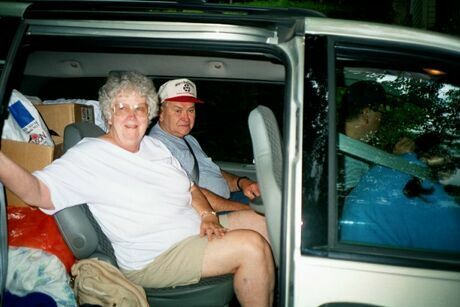 My parents, brother, and his girlfriend would be arriving the next day, because one night at the cabin was all my mother could take. I was acutely aware that in this remote part of Potter County there is no easy access to emergency services. There is no land line at the cabin, cellular service is nil, and neighbors are few and far between. The nearest hospital is 20 miles away, much of it over dirt roads. I was the only adult there to keep the girls safe. Nevertheless, we arrived excited and ready for fun. We quickly carried in our bags, made the beds, and decided to take in a movie in Coudersport. I love Coudersport, the only town in America where I feel sophisticated. There is one movie theater with one screen, and it was playing "Frequency" with Dennis Quaid. We enjoyed the evening show and headed back to the cabin. Now Potter County is great fun by day, but takes on a spooky vibe after dark if you are a big chicken like me. As we drove back over the desolate mountain roads, my imagination was running away with me. I was recalling every ghost story and bear attack tale I had heard in these woods. I tried to quell my rising fear about what was lurking out there in the dark. Kimber wanted to spot deer, but I insisted we keep the windows up tight and the car moving fast. She picked up on my nervous tone, but Rachel was oblivious. "A psycho killer could be waiting along the side of the road!" "There's a tree across the road." Now what? I did not know an alternate route to the cabin without going all the way to Cross Fork some 22 miles away. I decided to try East Fork Road despite the warning. Maybe those people were playing a trick on us. But sure enough, there was the fallen tree. We fearfully got out and studied the situation. The tree spanned two-thirds of the road, leaving a narrow path before a sheer drop-off. There was no way I could risk driving around it. In desperation, we tried moving the tree, all heaving together, but it would not budge. We jumped back in the car and locked the doors. What to do? I remembered a payphone at the Cherry Springs airport. We did a 12-point turn trying to avoid driving over the bank and headed back. The airport was dark and deserted. In fact, it's one of the darkest places on the east coast. I told the girls to lock the doors as soon as I got out and not leave the car for any reason. As I dialed the phone I was scanning in all directions for danger. Thank heavens I got through to Dad who told me another way back to the cabin. Backtracking a few miles toward Coudersport, we took a seldom-used dirt road that would eventually lead to the cabin if we turned correctly at a couple of intersections. There were no cabins, no sign of human beings, only porcupines. If the car broke down or we got stuck in a ditch, we would not be found until Dad arrived or called the authorities. I was already envisioning foraging for berries and grubs and fending off escaped convicts. "Wait here until I unlock the door, then run for it!" In we dashed, slammed the door shut, and engaged the deadbolt. We would opt for the pee bucket that night rather than risking the outhouse. Up in the bedroom, we shut the trap door and tried to calm down enough to sleep. There was still the possibility that the criminally insane escapee would break in. The next day when my family arrived I was never so glad to see anyone in my life! And I vowed I would not return to Potter County without another grown-up. The rest of the family arrives. Postscript: Our beautiful, sweet, friend, Rachel ,passed away in 2010. See my tribute.